The Duke and Duchess of Sussex have told New Zealanders "we are with you" as they signed a book of condolence for the victims of the Christchurch terror attack. Heavily pregnant Meghan wore a pair of earrings featuring a crossed feathers design given to her by the country's prime minister Jacinda Ardern. 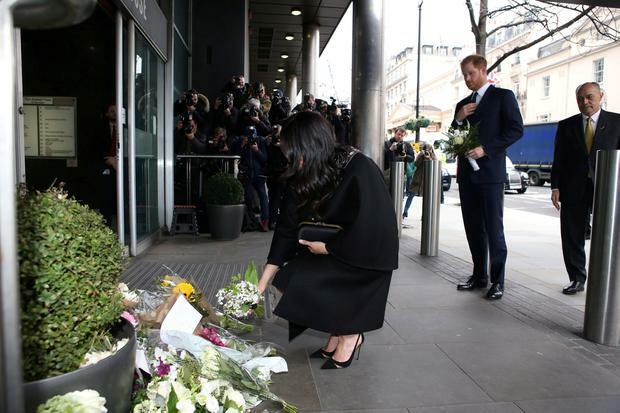 They both placed bouquets of flowers outside the building in central London, adding to the pile of floral tributes which has grown since 50 people were killed after a lone gunman opened fire at two mosques during last week's Friday prayers. On a single page, they left the message: "Our deepest condolences... We are with you." Beneath their signatures was the Maori word "Arohanui", meaning much love. Meghan said "we are with you", adding she was "just devastated" by the atrocity, as she cradled her baby bump. Harry said "it's just very sad" as he asked about their connections to Christchurch. Sir Jerry said: "We are overwhelmed by the tremendous amount of support we've received from across the UK. "Their Royal Highness's visit is reflective of this outpouring of support and it was wonderful to welcome them to New Zealand House." Meghan's appearance came more than a week after her last official public engagement before the arrival of her baby. She said Meghan's pregnancy "increased my respect for the role that she's playing at such an often tiring time", adding: "I have real empathy and I think she's incredible." The duchess in turn praised the efforts of Kiwi women who fought for the right to vote 125 years ago, saying they were "universally admired". In a joint message, the Duke and Duchess of Cambridge and the Duke and Duchess of Sussex said: "We have all been fortunate to spend time in Christchurch and have felt the warm, open-hearted and generous spirit that is core to its remarkable people. "No person should ever have to fear attending a sacred place of worship."